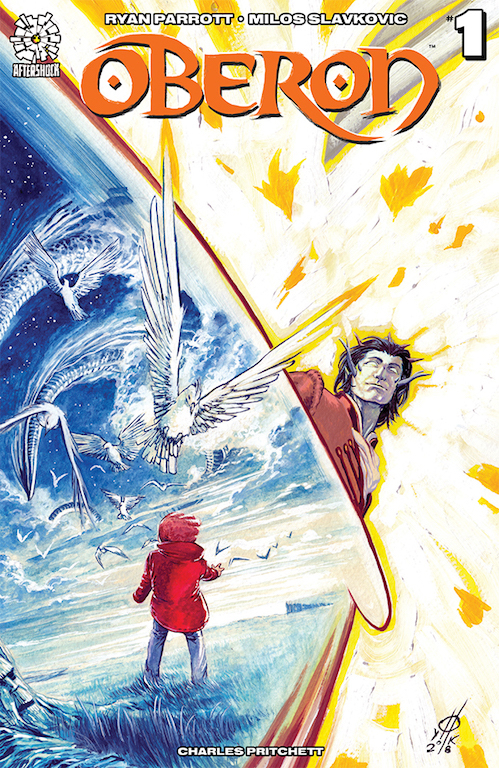 Oberon #1 Review – AiPT! The artwork is masterfully crafted and full of bright vibrant colors and amazing detail. Aftershock Comics debuted its latest fantasy title Oberon in comic book stores this week with a magnificent premiere issue that really sets the stage for what looks to be a wondrous tale of magic, monsters, mayhem and mystery. This first issue starts off in a mystical forest with a frog named Thornberry who is charged with protecting a lantern that contains an ancient light which, if extinguished, will herald the return of an ancient evil that once threatened to consume all of creation. The story then turns its attention to San Francisco and a young girl named Bonnie Blair who lives there with her mother, father, and her sister Riley. Bonnie is home-schooled, spending most of her free time at home with her family or at the library with her face buried in a book. One fateful night as Bonnie is walking home from the library, a mysterious figure casts a spell on a nearby dumpster, transforming it into a gigantic trash monster known as a Rot Golem. The creature lunges after Bonnie as she runs down the alleyway desperately trying to escape its clutches. As the enraged beast closes in on her within just a few inches from its prey, a tall and rather strange looking man wearing a red coat appears from out of the shadows and tells her to climb inside of his jacket. Bonnie enters the man’s garment and is magically transported to an enchanted forest the likes of which she never could have imagined in her wildest dreams. A couple of moments later, the mysterious rescuer appears and introduces himself as Oberon, King of the Fairies. Oberon tells her that she is more special than she knows and that he has been looking for her for a very long time. He then tells her that she was kidnapped as a baby and hidden away on Earth, claiming that her parents are not who they pretend to be and the life that she has known all these years is nothing but a lie designed to keep her trapped far away on Earth. Oberon also informs Bonnie that the books that are scattered throughout her home are in fact alive and watching her every move, making sure that she never tries to escape. Upset and emotional over this, Bonnie demands that he return her home at once. Oberon does as she asks, and before parting ways he gives her a bell and tells her that if she ever finds herself in need of him again just simply ring the bell three times and he will appear to assist her. Bonnie returns to her house and tells her parents of her traumatic ordeal and the wild accusations made by the so-called King of the Fairies. The truth quickly reveals itself to her however, as Bonnie rips a page out of one of the books, causing the entire bookshelf to come to life with every book leaping up from the shelves and flying up in the air to attack her. As the two impostors who she believed to be her parents race back into the room, Bonnie must now face the horrifying truth that this has all been a lie all along. Finding herself now trapped and not knowing who or what to trust, she rings Oberon’s bell three times, summoning him to her rescue. Oberon instantly materializes behind her, wrapping the arms of his jacket around her and magically whisking her away from the danger at hand and thus beginning fantastic adventure together. The issue ends as it began, in the Forgotten Forest with the ever diligent Thornberry making his rounds and ensuring that the lantern remains lit and out of darkness. This time however, as Thornberry passes just out of sight of its luminous glow, the lantern is suddenly snuffed out into darkness. The writing on this title is superb. Ryan Perrott come right out of the gates with a complex yet fun story that is rich in character, charming and heartfelt, with just enough subtle foreshadowing of the mystery and intrigue yet to come to really captivate the reader and keep them coming back for more. Perrott has crafted these two main characters very thoughtfully, making them both feel instantly charming, relatable, and likeable. Both Oberon and Bonnie are unique, interesting, and somewhat tragic enough that it very easy to get invested mentally and emotionally in both of their stories and struggles. This is a world and adventure that is exciting and action-packed with just the perfect amount of comedy and darkness thrown in to complement and accentuate, without taking away from its whimsical modern day fairy tale charm. Milos Slavkovic’s artwork on this book is a visual treat from beginning to end. Every page contains wonderful detailing and beautifully vibrant, lush coloring. His use of shading and darkness has a great balance to it. At no point does it impede upon the beautiful colors that he uses, yet it still manages to effectively set the mood and the tone of whatever scene or frame that it is used in. Each character and creature in this imaginative world is drawn beautifully and exciting to look at. He really brings these two distinctly different and unique worlds together in a way that looks and feels very natural and seamless. There is such an excitement and energy to his artwork that at times the intense action sequences feel like they leap right up off from the page and into your imagination. There was a point early on in the beginning however, in the Forgotten Forest where between the light post looking lantern in the middle of the woods and an animal walking around dressed in clothing and armor that it took on a bit of a Chronicles of Narnia look and feel. While that may not necessarily be a bad thing, it did take away slightly from what is otherwise a very unique and original feeling world and story within. Overall, this is a magnificent first installment that effectively grabs the reader’s attention, establishes and defines this magical world and the characters inhabiting it masterfully, and leaves the reader on the edge of their seat with excitement and anticipation for the issues to come. I highly recommend this title to anyone who is looking for dark yet whimsical fantasy, unique story and characters, and exquisitely crafted artwork. As beautiful as it is captivating. Its story is unique, compelling, and wonderfully complex without compromising its whimsical sense of fun and adventure.